I joined the May 21 search for Are Hjørungnes who had been missing for one week after failing to return from a trail run with H.U.R.T. 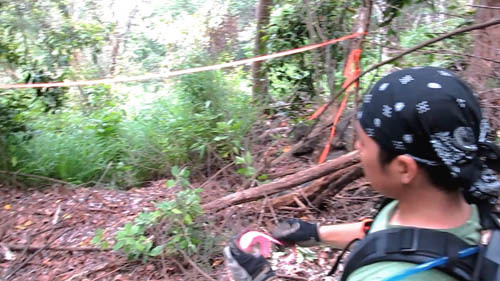 (Hawaii Ultra Racing Team) on the Kealia Trail above Dillingham Air Field in Mokuleia. Although H.U.R.T. does 100 mile races doing multiple circuits on this trail system, the run that Are did on Saturday, May 14, 2011 was just to the top of the mountain and back down to sea level. Are was so fast that he headed back down the mountain before of the rest of the group. But when everyone else checked out at the bottom of the mountain, Are had not returned. He was last seen at 9:45 AM on Point H on the map. His car remained in the air field parking lot and he was neither seen nor heard from again. Are Hjørungnes was from Norway where he was an Engineering Professor, and was on a one-year sabbatical at the University of Hawaii at Manoa with the Electrical Engineering Department in the College of Engineering. When HURT discovered Are was missing, HURT immediately retraced the run route, but there was no sign of him. So HURT reported the incident to the authorities — the Police and Fire Departments. HURT and the Police and Fire Departments searched the trails, roads, and the places he could possibly be for the next 3 days with teams on foot, in helicopters and with dogs. But Are was no where to be found. The Fire Department routinely stops searching after three days, so the volunteer phase of the search effort began on the 4th day — Wednesday, May 18. 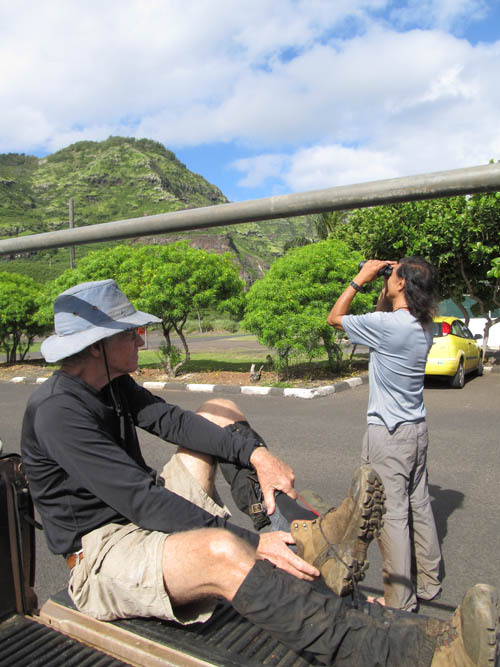 Fred Boll coordinated volunteer search efforts for the Hawaiian Trail and Mountain Club (HTMC) and asked for volunteers. 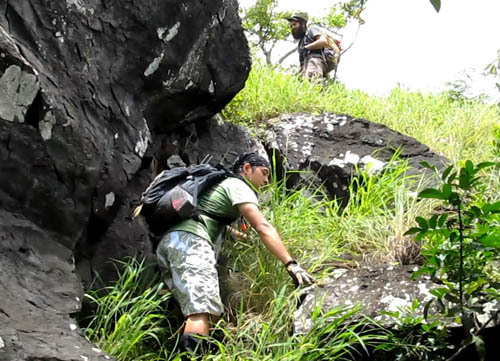 HURT, HTMC, and other volunteers combed the network of trails and roads in the area. But he was still not found. 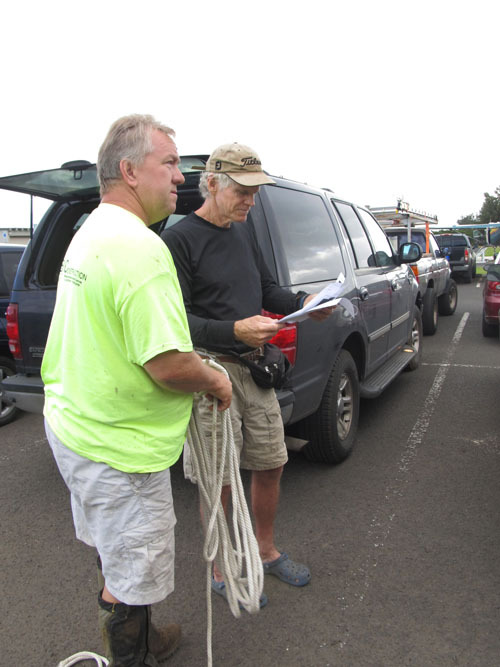 Fred Boll sent out a call to HTMC members to do a big search on Saturday, May 21 — one week after Are’s disappearance. I was pleased when the company I work for — InSynergy Engineering — postponed its company hike — so I could participate in the big search. More things fell into place when Justin Ohara agreed to participate and August Smith could come. August never has Saturday off, but his boss at Sunshine Arts was so concerned about the missing trail runner that he let August off on Saturday. Since the obvious places had been searched, I speculated that perhaps time was running out for Are as the sun lowered on the horizon and in a last ditch effort to get down before dark, he took the most direct route over the cliffs that overlook Dillingham Airfield. He might have injured himself and was unable to come down. Since 7 days had past he would badly be in need of water and food. So I brought 6 liters of water, an extra sandwich, and several oranges in case we found him. When I checked in with Fred Boll, I learned which areas had been searched and which had not. 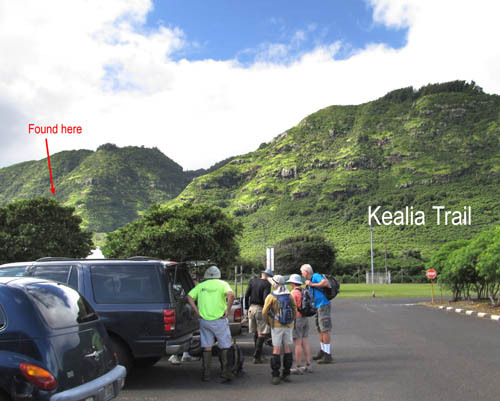 One HTMC group was already intent on searching the cliffs to the west of the Kealia Trail that overlook the quarry and reservoir. So I came to the conclusion that the best use of my efforts would be to search the cliffs one ridge over to the east of the Kealia Trail. 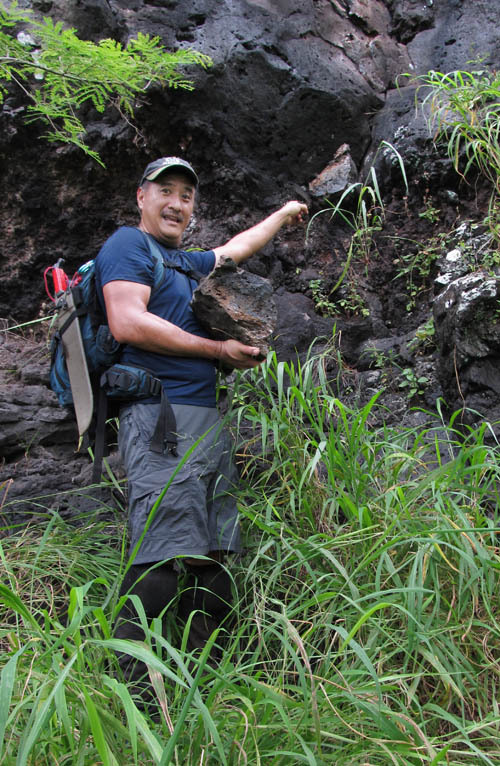 Veteran searcher Kenji Suzuji — who found the 2 Danish Girls on Ohulehule in 1999 — scanned the ridges with binoculars for anything out of the ordinary. 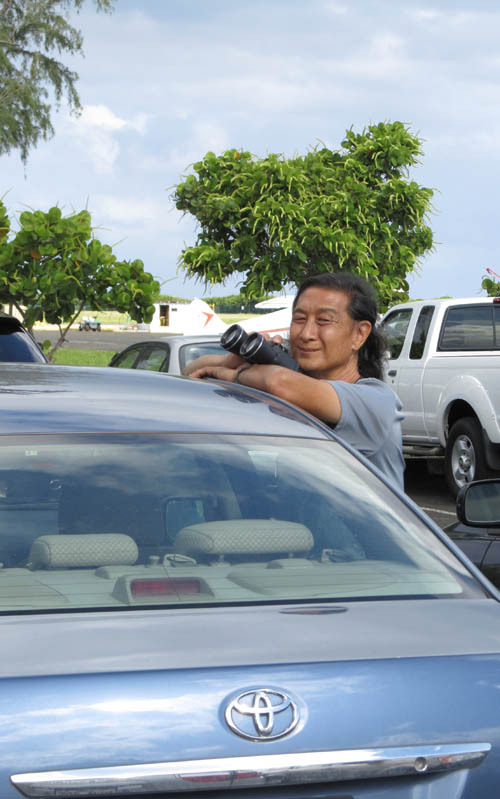 Kenji asked if I had a theory about what happened and I shared my personal story being lost alone on Molokai in 2006. With the day drawing to an end, I launched a “Hail Mary” effort and went off-trail on what I thought would be a short cut to get out before dark. But that was an illusion and I made my situation worse by going off-trail. I had to spend a cold night at 4,000 feet on Kamakou. The next morning I was able to retrace my steps and found my way back to the trail and back out on my own. So I knew all too well how the motivation to get out before dark can lead to bad judgment and undertaking huge risks. After sharing what I had done in the past and my theory where Are might be, we pushed off on the search. 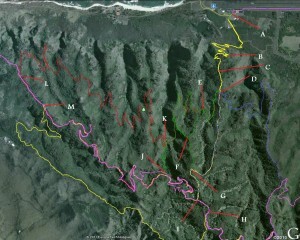 The goal of my team was to search the cliffs one ridge over from the Kealia Trail. 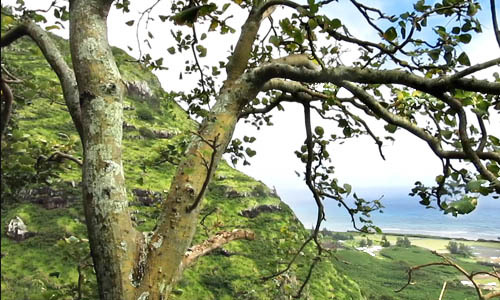 After making our way through high grasses and haole koa trees to the opening of the valley, we split into two groups — those searching the valley with Mike and those searching the next ridge over with me. In addition to myself, my group included Justin Ohara, August Smith, and Gavin Terukina. 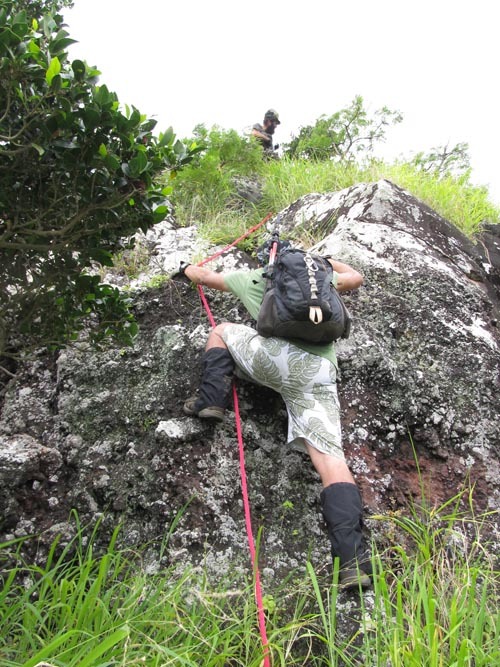 When we reached the foot of the ridge to the east of the Kealia Trail, a 25 foot rock face blocked our way up. We almost had a bad accident climbing up the first rock face. A toaster sized rock Justin used as a foothold broke off and Justin fell. Fortunately, he only fell for about 10 feet onto a grassy slope which cushioned his backwards fall. Had he fallen on rocks and/or on a higher cliff, the result would have been much worse. Justin escaped unhurt but was dazed and had the wind knocked out of him. So he rested on the grass for a bit to recover. The rocks on these cliffs are weak and break-off under your weight. The rock I’m carrying in my hand broke-off from the rock to which I point. The strange thing is that I used that same rock as a foothold just before Justin did. And while it held for me, it did not for him. Apparently, I must have weakened the rock and Justin was the “straw that broke the camel’s back”. With our first attempt up the rock face unsuccessful, we contoured to the front side of the cliff to look for an easier way up. We were pleased to find a way up to the next level marked with blue ribbons. We followed the ribbons up a trail which led to a large grassy area punctuated with dead trees. There was also a water catchment structure on the upper part of the large grassy area. Rock faces are scattered throughout the ridge — many of which can be surmounted by contouring around them and regaining the ridge line further up. 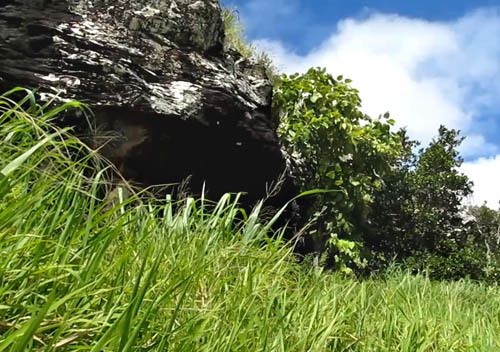 When we could find no way around them, we climbed up and over the rock faces and proceeded up the ridge through tall grasses and haole koa trees. 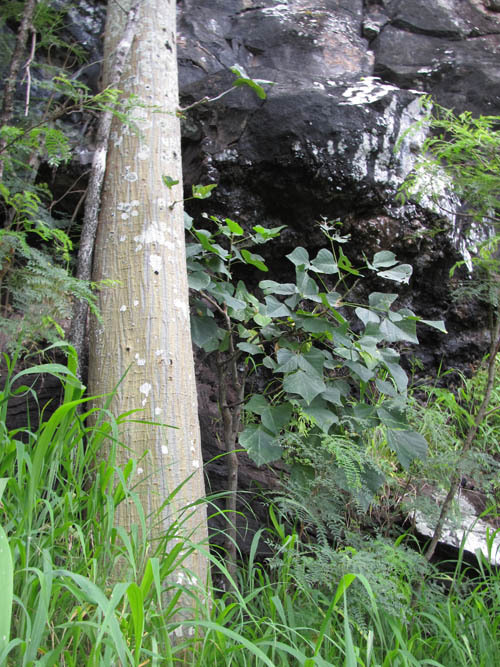 When we reached a small grove of native wiliwili trees — which were surprisingly healthy — we followed the blue ribbons which led further east along a ledge. While making our way over the ledge, I caught wind of the smell of death. The scent was very faint and blew in and out with the wind. I brought the smell to the attention of the others and we followed our noses as we made our way along the ledge. When the wind shifted, it appeared as if the smell might be coming from higher up, so we climbed up to the next level when we saw a crack in the rock face we could exploit. But after making our way another 100 feet or so up through the grasses, the scent grew weaker. We decided to retrace our steps and mark the places were the smell was strongest. When the wind shifted once again, it seemed like the scent might be coming from below. So we climbed back down the crack we had just climbed up to explore the original ledge we were on but further to the east. When nothing was found, I suggested we drop down one more ledge using a path under a christmas berry tree I had seen on our way over. When we dropped down to the next ledge down, the smell was strong. And as we searched the tall grasses beneath the trees, Justin called out that he found the body! The tone of Justin’s voice told me he was distressed. August immediately pulled back and refused to cast his eyes on the body. After tying a long ribbon between the trees to mark the spot I retreated too. We knew it was possible to find Are dead, but we were not prepared emotionally or psychologically. Choosing to “cross that bridge when we get there” we suddenly found ourselves right smack in the middle of that bridge. We were all shaken — figuratively and literally — and I was unable to take an in-focus shot. Somehow I managed to call 911 to alert the authorities. Since they were unable to acquire the GPS coordinates of my phone, Gavin acquired them with his device and I read them to the operator over the phone. But for some reason they couldn’t use the GPS coordinates I read over the phone. So the operator told me to get to a clearer area and call back. We decided to go back to the large grassy area, all the while cutting back tree branches that blocked the way, and marking the way with ribbons. As we cleared the trail on our way out, tears welled up in my eyes as I thought of Are’s family and friends who spoke so highly of him on the FindAre blog. I knew they would be devastated by the news. When we reached the large grassy area, I called 911 again, and was patched-in to the search and rescue crew at the air field and to the helicopter in the air. After the helicopter was directed to look for us in the large grassy area with dead trees, they spotted us and 2 rescuers from the helicopter jumped out. The others in my group were rattled and did not want to go back to the body. They asked if I could take the rescuers to the body by myself. So I bid farewell to Justin, August, and Gavin and motioned for the rescuers to come to where I was. One of the two rescuers was local actor and celebrity Kala’i Miller whose easy going demeanor put me at ease despite my high level of anxiety. When I told them the body was about 100 yards up ridge and 300 yards to the east on a rocky ledge beneath a cliff, the other rescuer — Kyle Lee — chided me for leaving the body. 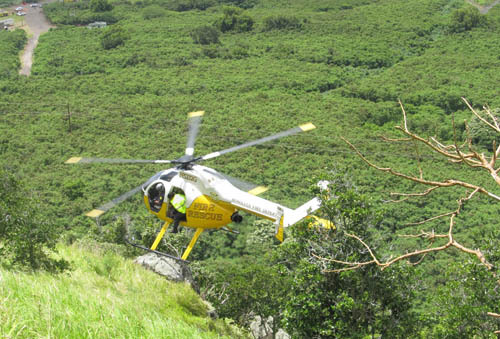 Apparently its easier for rescuers if you stay with the body and direct the helicopter to it. With rescuers in tow, I made my way back up the ridge, veered-off onto the ledge, and along the cliffs where the body was located. 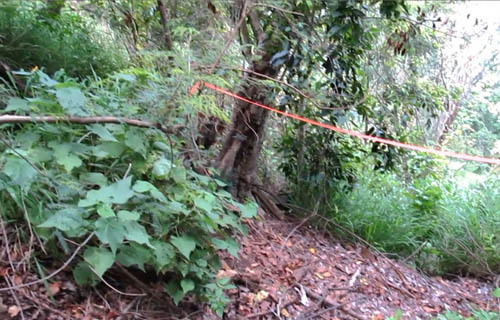 The body was situated down slope on a ledge with a 40 foot cliff above. I speculate that he attempted to descend the cliff, fell, and died on impact. Perhaps a crucial foothold broke and sent him plummeting to his death. 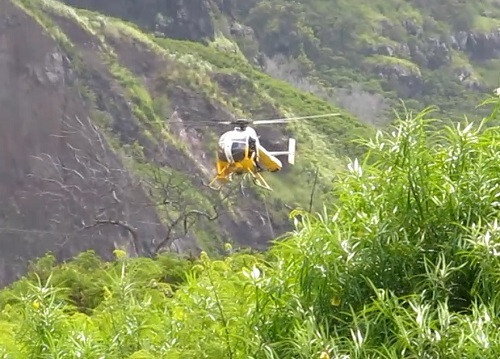 After leading the rescuers to the body, Kala’i Miller offered me a ride back on the helicopter. But I did not want to remain with the body — let alone watch the rescuers place the body in the body bag for transport — and unhesitatingly declined the offer. With my job done I turned around to make my way back out on foot. As I retraced my steps back down the mountain, I was overcome with sadness and realized how fleeting life really is. I reflected on the risks I take on the trail and came to the conclusion that I am ill-prepared for their potential consequences. While making my way back down the mountain, I heard the helicopter make several trips transporting the body and rescuers back to the air field. When I rejoined the rescuers, the fire department official overseeing the operation was very nice, thanked me, and asked if there was anything they could do. Kala’i Miller told me we did good finding the body — Are’s family and friends needed the body to be found in order to have closure. The other rescuer who scolded me for leaving the body — Kyle Lee — apologized for being so forceful and thanked me for doing “the hard part” — finding the body. I accepted his apology and shook his hand. I then regrouped with Fred Boll and the other HTMC searchers before leaving for the day. Within the next two days, I learned that Are had a meeting on the afternoon of May 14. So Are may not have been motivated by getting out before dark but by being on time for his meeting. I also learned that he was into orienteering — navigating with map and compass — which probably gave him confidence in seeking a way down. But he was not familiar with the network of roads and trails above the Kealia Trail nor the rocky cliffs that lay between him and his car. I speculate that when he saw Dillingham Air Field off in the distance from the top, he veered off the road to descend the ridge. There is a trail that descends the ridge — although a very faint and overgrown one — the one we found marked with blue ribbons. 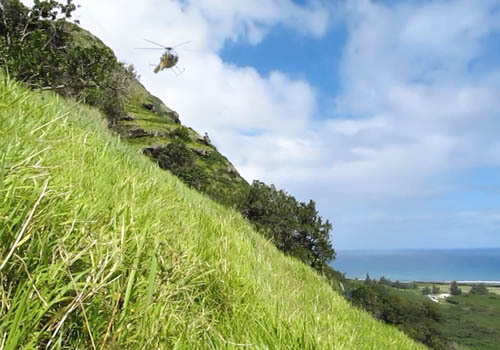 Based on where we found his body, Are almost succeeded in getting back down to Dillingham Air Field — he made it more than half way down the face of the ridge. But somewhere down the line he got off trail and was confronted by a cliff. Rather than retrace his steps to find an alternate route he made a fateful decision to descend the cliff and fell. Deepest sympathies to the family and friends of Are Hjørungnes. Are was loved and cared-for by many, and his absence will leave a big void. Farewell Are Hjørungnes — may you rest in peace. While working on the video for this account, I realized just how crucial the late afternoon hours can be on the trail. When getting back before sunset becomes the driving motivation, one is more willing to take big risks — like going off trail. Staying overnight is terribly inconvenient, but it’s your best bet to getting through the ordeal unscathed. Don’t panic, keep your wits, and stay on the trail. You will have more time the next day to get out and you will be found — if you stay on the trail. The trail is the shortest way back and you need to retrace your steps if you went off-trail. Bring more water than you need and keep a jacket and space blanket in your pack just in case you need to stay overnight. God speed my friends. Many thanks to everyone — from professionals to volunteers — who helped search for Are Hjørungnes. HURT and the ultra running community were out searching every day. And so was Fred Boll and a number of HTMC members when the volunteer phase of the search began. 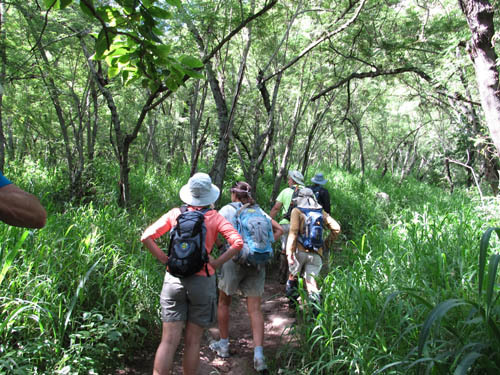 On Saturday many hikers from the community participated — from boy scouts to concerned private citizens — it was nice to see so much aloha and kokua. 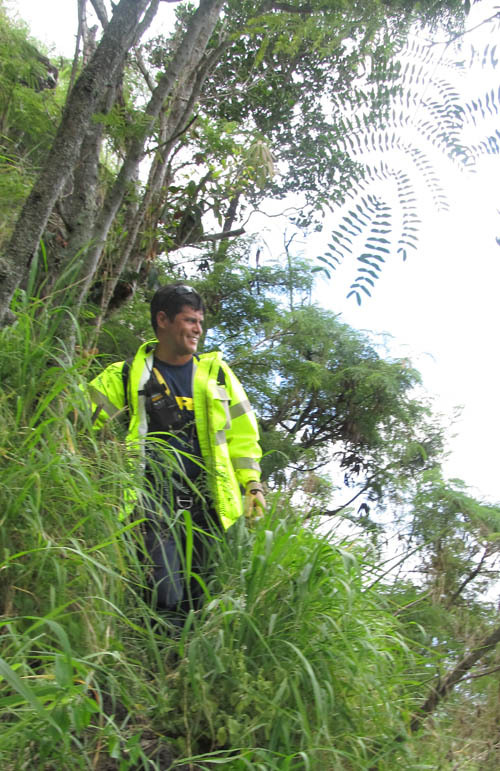 The Honolulu Fire and Police Departments were absolute professionals conducting the search and retrieving the body. I hope Are’s friends in Norway who set up the FindAre Blog will be comforted to know that their efforts were crucial in disseminating maps and the latest news to scores of volunteers on the ground. God bless my friends. Excellent suggestions on what to do when lost Nate. Rest assured your advice will be used by me if I ever am unlucky enough to be in a similar situation. Prepare for the worse and hope for the best. And like Kyle Lee said, thank you for doing the hard part of bringing closure to the family. Safe hiyaking. 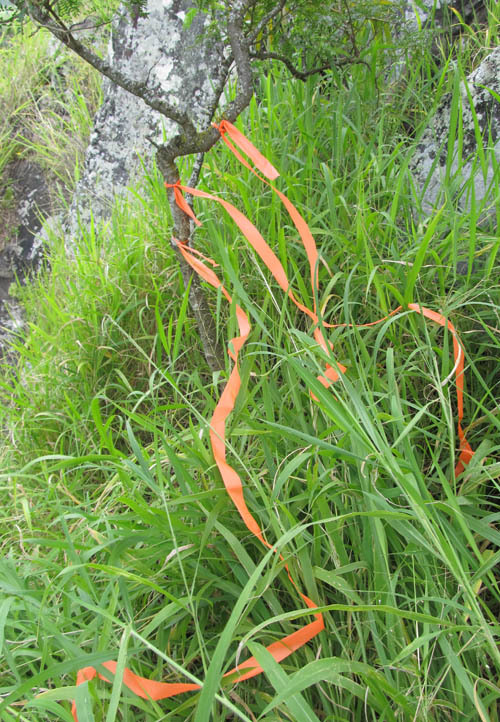 My friend Dan Anderson also suggested if you keep a marker and ribbon handy, then if forced to go off trail when lost, you can place ribbons marked with your intials as a way for others to follow. Just throwing an idea out there in case it’s helpful. 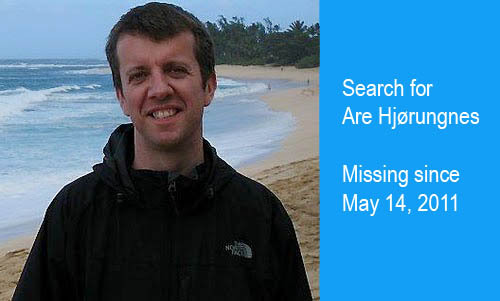 Nathan – You and the HTMC did a heroic job with the search. I thought rescue crews found the body until I read your blog. Again, I commend you for your efforts. Thanks for climbing that cliff guys, looks way easier than it was I am sure. 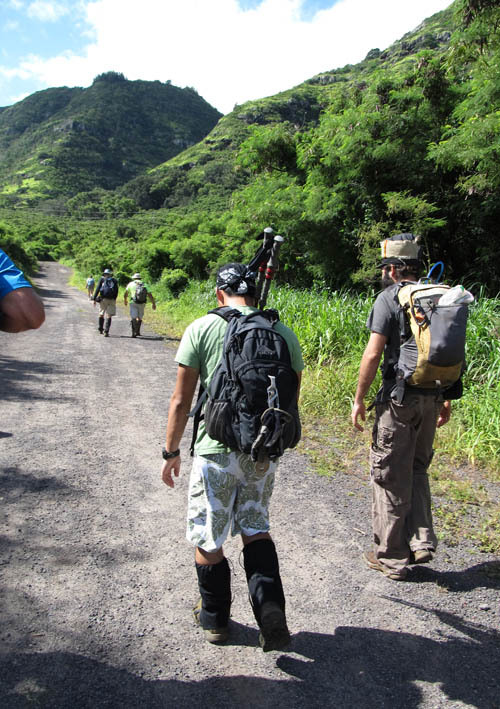 In general, if you are going to go out on any Hawaii trails it is best to carry an emergency flashlight. I usually carry a small one watt-er around my neck. They are cheap and light now and will last a few hours. Going down the trails in the dark is inconvenient but a lot safer than going off trail. I’ve seen a dozen tourists using phones to get out of the hills above Honolulu. Another alternative is to call a friend, and sit down and wait for them to show up with proper night running gear. You will feel stupid but be more than happy to buy the beers and be the goat. 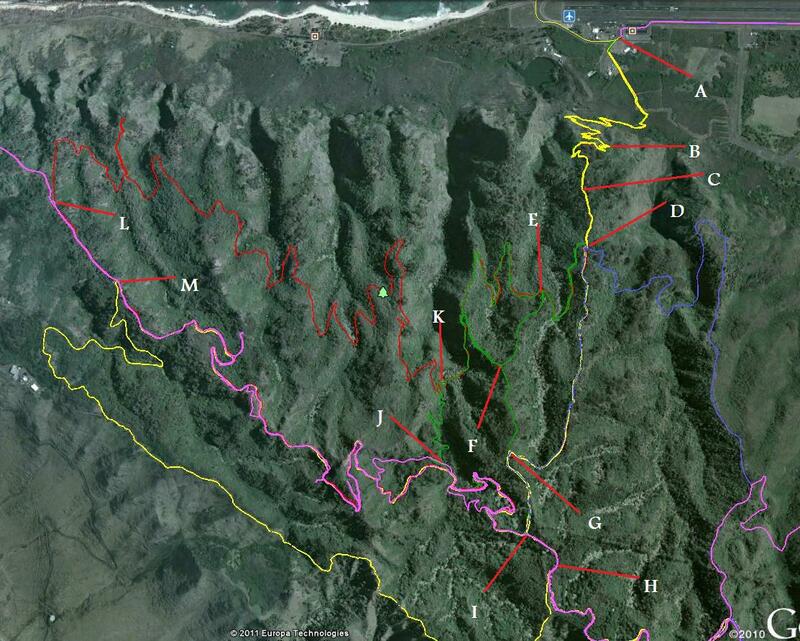 If you sit down and wait along side the trail you will generally be found in 24 hours or less. 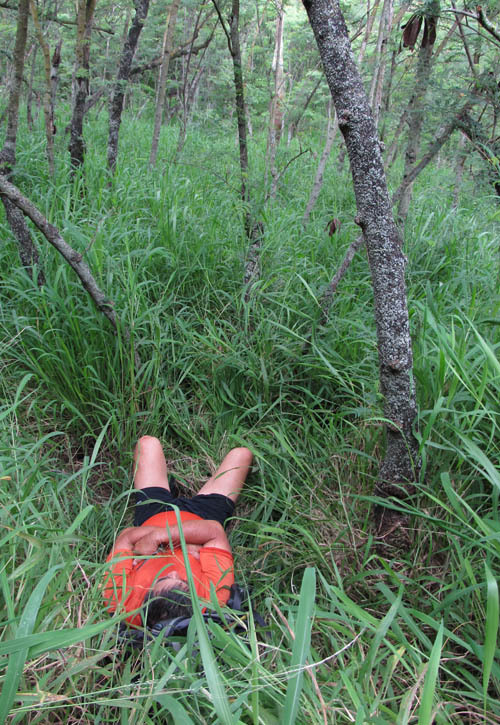 If you dig yourself into the bush you may just find an entrance to Milu and never be seen again. Nate, Thank you to you and all those who continued the search and brought Are home. I was in Oahu a several times a few years back for work and ran HURT. What an amazing community. Though I didn’t know Are, I know how much it impacted my friends there, many continuing to search diligently. I’m in SAR in NM and the tips you all gave are great. I always run with a space blanket, a power bar and headlamp, just in case; you never know. Waiting til morning is surely the best bet, and staying on the trails, especially if you’re hurt, will make you easier to find. Again, thank you and bless you and all the others who committed to bringing Are home. You are all in my thoughts in prayers, as are his loved ones. I wanted to express my gratitude and thanks to you, your fellow HTMC members, and the many other volunteers who selflessly helped search for and find my friend Are. I am still trying to cope with the loss of my friend, Are, who I have known since 1998 when I was a graduate student at UC Santa Barbara, and he was visiting from the Norwegian Technical National University in his home town of Trondheim. As others have written, Are was an outstanding researcher who had the amazing ability to approach technical problems and life with a remarkably open mind and to build bridges between people from all over the world. But more than anything else, Are was an extraordinarily kind, generous, and thoughtful friend. I visited Are in Oahu April 5th until the 20th, and spoke with Are regularly on Skype as well as staying in touch via email In fact, I spoke with Are on the afternoon of May 13th. As usual, we made jokes, shared laughter and spoke about our lives and the plans we were making. You can imagine my shock when I heard he was missing the following week. Are is a friend whose loss I will never get over, but you and your fellow HTMC have rescued us, his friends and family, from the endless agony of helplessly worrying and wondering. Great Job Nate and HTMC! Thank you for all your effort in the serch, and for finding Are! I just came home from Are’s funeral. Although it was horrible sad, it was also inspiring to hear all the stories of how he had made deep positive impacts on people around the world. It means a lot for his friends and family to have a tombstone to visit. When Are was found, all hopes and wishes for a happy ending disappeared, but it opened up for the peace of knowing that makes it easyer to go on. Jaran — I too was impressed with the outpouring of love and fond memories for Are. I only know Are from what was shared by his family and friends online. It is said you can tell a lot about a man by the company he keeps. The words told me he was loved by many and was a fine friend, colleague, and mentor to many. My heart goes out to you. God bless. Good job. Sad story, but important to find the body for closure. Best thing I ever used for helping a helicopter find you is smoke bombs. The ones I use are military surplus, about an inch+ in diameter and and inch and half long. Light one of those and chopper comes right to you, even in dense canopy. Easy to carry in an emergency kit.